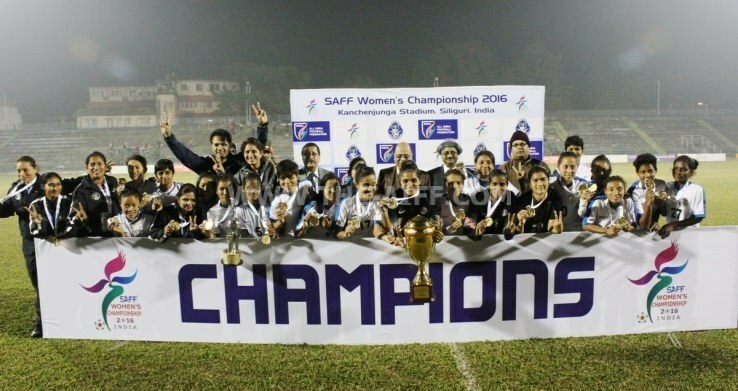 Indian women’s football team scored another record for the fifth consecutive SAFF Football Championship title by winning the title. India defeated hosts Nepal 3-1 in the final. With this victory, India reached its 23-match record of losing no matches in the history of the tournament. For India, Dalima Chhibber (26th minute), Grace Dangmei (63rd minute) and transferable Anju Tamang (78th minute) scored goals. India defeated Bangladesh in the semi-finals. In the 26th minute of the match, India got a free kick and from 30 yards distance, Dalima gave the team an edge over the spinners. Six minutes later Ratanbala Devi tried to double India’s edge, but the opponent goalkeeper foiled her effort. For Nepal, Sabitra scored the equalizer in the 34th minute of the game. In the second half Grace scored the goal in the 63rd minute to give India a 2-1 lead. After 15 minutes, Anju (78th) secured the ball in the goal and ensured India’s victory and trophy. All India Football Federation (AIFF) president Praful Patel also congratulated the women’s side on its success. “Congratulations to our women’s football team for winning the SAFF Championship. You have once again proved that you are the true champions. Keep up the good work and add many feathers of success to your crown. Best wishes,” he said.